Eric Franklin believes that a person’s physical habits and mental attitudes are the key to living a long, happy and healthy life. 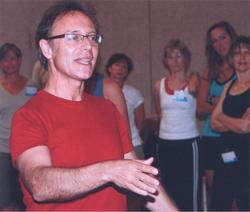 His work embodies true mind-body principles that can be incorporated into most lifestyles and exercise modalities. He developed his method by employing a combination of practical experience, scientific and anatomical analysis and personal insight. His unique style is now embraced worldwide by a variety of health and fitness professionals. At the core of Franklin’s work is the use of experiential anatomy, education and imagery. His teaching includes (1) effective, functional movement; (2) an educational process that embodies optimal movement taught in a simple, joyful manner that everyone can understand; and (3) the mind-body tools (imagery) used in the process. “The Franklin Method is about better coordinating the hidden strengths of the body and creating the basis for efficient and gentle movement,” he explains. “Its aim is not only to improve what we have, but to improve what we can become through changing structures, so that we can feel and move more harmoniously. It is not what you do from time to time for the body, but what you do habitually, that determines your fitness. Time spent in the gym or at sports should be a continuation of a daylong awareness of one’s body and its fitness,” he says. For more than 20 years, Eric Franklin has worked as a successful dancer, choreographer, educator and author. Director of the Franklin Method Institute® in Switzerland, he has taught at New York University’s School of the Arts as well as The Royal Ballet School and the Laban Center in London. For example, says Franklin, it is not enough for clients to know what body part they are working on (e.g., vertebrae, pelvis, scapulae); you must help them visualize that area in the body. “Can your clients see the design [of a body part]? Do they know the purpose of this design, and based on the purpose of the design, [do they know how to] use it in the most efficient way possible so it can do what it is made to do?” He says once you help clients understand these concepts, then you can introduce appropriate cues. “In the Franklin Method, you are creating a process where the student is telling the teacher the truth about the design and function of his body. If the student is empowered, he’ll learn,” he says. Franklin believes that the larger the teacher’s imagery repertoire, the more effective he or she can be in communicating the proper movement and mental processes to the student. One of the skills of an effective educator, he says, is not just to impart an image to the client but also to see whether it is creating a proper felt response. Franklin’s own students learn new ways to share this kind of information to help their clients and themselves function better in their own bodies. To learn more about the Franklin method, please see the full article, “The Franklin Method®: A Revolutionary Approach to Movement,” in the online IDEA Library or in the March 2010 issue of IDEA Fitness Journal. Eric Franklin will be presenting sessions at both the 2010 IDEA World Fitness Convention™, August 4–8, in Los Angeles, and at the 2010 Inner IDEA® Conference, September 23–26, in Palm Springs, California. Please check the links for details.